There is one other way in which cooking fills a similar role as videogames: It brings exploration and discovery back into everyday life. Before I cooked, my world sometimes seemed confined to a handful of bars and cafes outside my apartment. Once a week there was the grocery store and the library. The imaginary, ruined cities of Rapture and Lordaeron seemed infinitely more vibrant and alive than the Midwestern college town that I called home. But as I started cooking, I began to notice shops I'd never seen before, despite passing them a dozen times a week: the Mexican carniceria, the German butcher near my house, the professional kitchen supply store next to the mall and the Italian deli by the gas station. I started talking to people who were really passionate about their small corner of the food world. The butcher who ran the Italian deli made us feel like family as he shared recipes and advice, taking us aside the day he finally got some rapini (a vegetable I had never seen until he shoved it into my bag along with a recipe for rapini and orecchiette). When I moved to Cambridge last year, I spent hours walking through the city, ducking into wine shops and butchers just to find those few who really knew what they were doing and took pride in it. Since taking up cooking I've made friends with bartenders, butchers, cooks and other specialists who love what they do and want to share their expertise and passion with anyone interested enough to ask. There is one butcher shop I frequent because they're the only people in town who really understand that bacon should be smoked heavily and sliced thick, that good sausage doesn't require much seasoning and that lard and veal bones are something that should be in every refrigerator. Finding their store was like finding a hidden treasure. 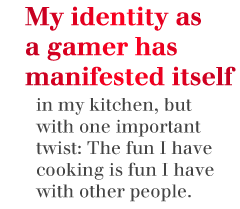 My identity as a gamer has manifested itself in my kitchen, but with one important twist: The fun I have cooking is fun I have with other people. The individual rewards of cooking, all those wonderful sensations and affirming accomplishments, pale next to the pleasure of serving a good meal to guests and loved ones. In gaming, my skills are only useful to myself; I can't game for anyone else, and playing with other people tends to be too intense to be relaxing. But in the kitchen, both the fun and the rewards are shared. Except for the dirty dishes. I cooked the meal, after all. Rob Zacny is a freelance writer and stress-baker living in Cambridge. More of his writing and cooking experiences appear at http://robzacny.com.